This year marks the 40th anniversary of LEGO Technic® and the 1H2017 line-up is not just big (with no less than 10 sets), it also includes a licensed model, the 42063 - BMW R 1200 GS Adventure. Of course we already knew as much from the toy fairs and official images that have appeared. What we didn't know until today was the B-Model for this set, and once again LEGO Technic has a surprise in store! 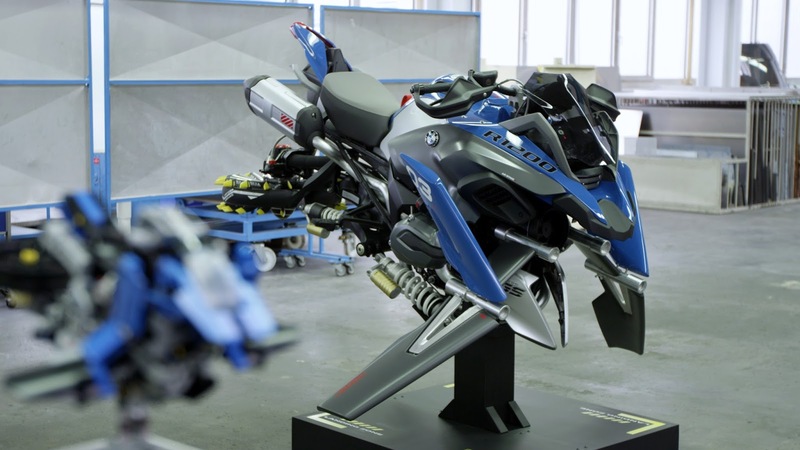 Today LEGO Technic reveals the BMW R 1200 GS Adventure Design Concept Hover Ride, developed in collaboration with BMW Motorrad design teams. The following is the official Press Release for this B-Model (a first in itself), as well as a number of pictures. Munich, February 16th 2017 – BMW Motorrad partnered with LEGO® Technic to transform one of the best motorcycles in the world into a LEGO model. The BMW Motorrad R 1200 GS Adventure model celebrates innovative design and engineering. A pure building adventure in 603 pieces. The alternative model as part of the typical LEGO Technic 2-in-1 building set is now taking this icon one step further – into the future. LEGO Technic Hover Ride complete with innovative functions and the signatory GS flyline allowing all fans to rebuild the BMW Motorrad R 1200 GS Adventure into a unique design concept model that removes all limits to motorcycles and allows imagination to fly without vesting technical plausibility. “What would happen if we designed a bike together? What would happen if we removed all limits for the alternative model? So we set the BMW Motorrad and LEGO Technic design teams a challenge, a challenge that has resulted in this amazing bike. Collaboration between our two teams was driven by passion and respect for the DNA of each other’s brands. It was fantastic to see how engaged and inspired each team was by working together, but I don’t think either of us ever imagined that this project would turn out as it did. 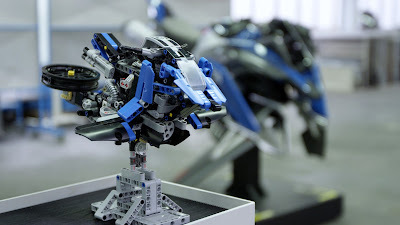 I guess it just proves that you can create anything with LEGO Technic. Even the future”, says Andy Woodman – Senior Design Manager for LEGO Technic. “It was a great idea and a superb creative challenge to develop a fictitious model from the parts of the LEGO Technic BMW R 1200 GS Adventure set. Our concept not only incorporates the BMW Motorrad design DNA with typical elements such as the boxer engine and the characteristic GS silhouette, it also draws on the LEGO Technic stylistic idiom”, says Alexander Buckan, Head of BMW Motorrad Vehicle Design. The life-size model of this design concept Hover Ride will be presented today during the LEGO World event in Copenhagen and will travel afterwards to different locations in Denmark and the “BMW Welt” in Munich. 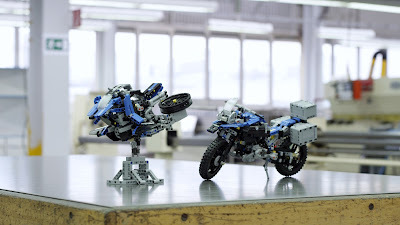 The highly detailed LEGO Technic BMW R 1200 GS Adventure contains not only this unique design concept model as part of the typical LEGO Technic 2-in-1 building set. There is also another surprise for collectors. As the LEGO Group is celebrating 40 years of LEGO Technic this year, a specially embellished LEGO Technic element is hidden in the set. Isn't the main lift generator, the large ducted prop made from the wheel rim, placed a bit too much towards the rear? It would have a tendency to make the bike go nose down as soon as it took off. Also, assuming there's a single prop in that casing (can there be contra-rotating props in a single duct? ), the rotational torque would be too much without something to compensate it; that's why most single-rotor helicopters have a tail rotor.